Music For 16 Futurist Noise Intoners is an evening-length concert of original scores and newly commissioned compositions for the intonarumori, or “noise-intoners.” An incredible group of musicians and composers from the experimental music world — including Einstuerzende Neubauten frontman and Nick Cave collaborator Blixa Bargeld, avant-garde saxophonist John Butcher, Deep Listening pioneer Pauline Oliveros, Faith No More and Mr. Bungle vocalist Mike Patton, sound and text-based performer Anat Pick, avant-garde musician Elliott Sharp, and composer and vocalist Jennifer Walsche collaborating with composer and film/video artist Tony Conrad, among others — have been commissioned by Performa to create and perform brand new compositions for the instruments. Recreations of historic Futurist scores will also be performed by leading intonarumori expert and scholar Luciano Chessa, who is co-curating the project with Performa’s Esa Nickle as well as overseeing the physical reconstruction of these remarkable machines. In 1913, the Italian Futurist and sound artist Luigi Russolo constructed a family of special hand-cranked instruments to realize an expanded field of orchestral sound. 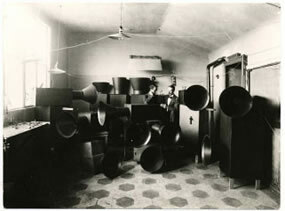 Called intonarumori (noise intoners), and built out of wooden boxes housing intricate mechanical moving parts with large metal horns attached to the sides, these spectacular machines could produce and modulate complex noises — including explosions, howls, buzzes, and hisses — that celebrated the new urban, industrial sounds that the Futurists so loved. As the first instruments capable of creating and manipulating noises through entirely mechanical processes, the intonarumori can be considered to be the original analog synthesizers, and the ancestors to the latest electronic synthesizers used today. As part of its celebration of the 100th anniversary of Italian Futurism, the Performa 09 biennial, in collaboration with the Experimental Media and Performing Arts Center (EMPAC) and SFMOMA, has invited Luciano Chessa to direct a reconstruction project to produce accurate replicas of Russolo’s legendary instruments. This project offers the first-ever replica of the set of 16 original intonarumori (8 noise families of 1-3 instruments each, in various registers) that Russolo built in Milan in the summer of 1913. These intonarumori are being physically built by luthier Keith Cary in Winters, California, under Chessa’s direction and scientific supervision. At the Town Hall concert, Chessa will present the first modern live performances of three pieces—a legendary fragment from Russolo’s spooky Risveglio di una città (1913), La pioggia nel pineto antidannunziana, a newly-discovered 1916 Futurist piece for intonarumori, and Words in Freedom by Futurist playwright and poet Paolo Buzzi, both of these latter diplomatically edited by Chessa—as well as his own L’acoustique ivresse, a piece for intonarumori and voice based on a sound poem also by Buzzi. Intonarumori scores by the likes of Blixa Bargeld, Jennifer Walsh and Tony Conrad, Pauline Oliveros, John Butcher, James Fei, Ulrich Krieger, Mike Patton, Luciano Chessa, and Elliott Sharp, among others, afford the intonarumori a repertoire Russolo could have never hoped for, and bring together for the first time on a performance stage a formidable group of world-renowned artists working in genres ranging from free jazz to electronic music and from minimalism to indie rock, all energized by a common love for Noise. Music for 16 Futurist Noise Intoners was commissioned by Performa and co-produced with the Experimental Media and Performing Arts Center (EMPAC) and SFMOMA. The concert premiered at SFMOMA on October 16, 2009, before traveling to New York for its Performa 09 presentation at Town Hall.